DP Jones & Co | Mad Web Skills | Web design, development and hosting in Shepparton, Melbourne, Bendigo, Echuca, Benalla, Central Victoria and beyond. 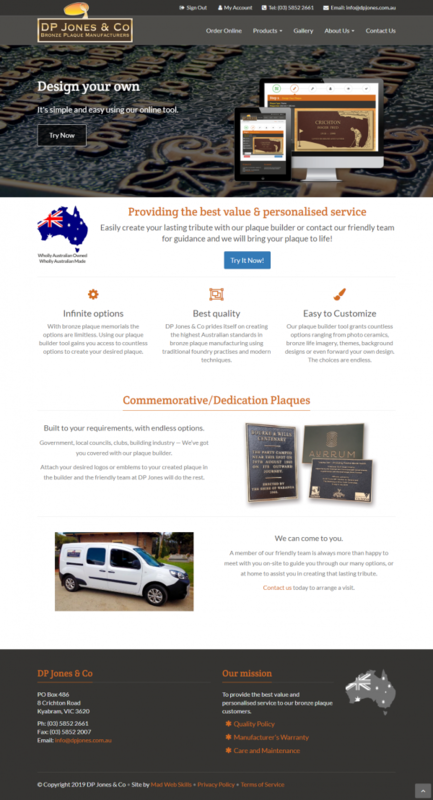 Mad Web Skills has forged a long-lasting relationship with Echuca-based bronze plaque manufacturer, DP Jones & Co, after building their first website way back in 2002. The latest version of their website features an online plaque designer and ordering system, allowing them them to do business 24/7. DP Jones & Co is a family owned company with more than 45 years of involvement in the Monumental Industry. The business operates two divisions, stone & bronze. Online drag-and-drop interface for designing your plaque directly in the browser. Online order tracking including payment and fulfilment. Photo gallery with examples of past works.